Bats are fascinating to children. Use this website to complete an SESE lesson or to tie in with the Primary School Green Flag for Biodiversity. Each of the Bat Fact web pages has an associated worksheet. Answers to the worksheets are provided here. We have created a downloadable 29 slide presentation so that you can present an illustrated lesson on bats. Notes on the presentation are also available. Think about where bats might be found in your area. 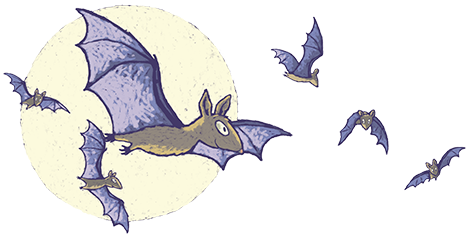 If anyone in the classroom has definitely seen a bat in their garden or house or around the school grounds, you can enter the sighting on Bat Conservation Ireland’s Bat Map. This also ties in with the Geography curriculum and mapping. Bats often fly around school grounds at night, particularly where there are mature trees and shrubs or a pond. Green spaces, mature gardens, old demesnes, rivers and woodlands are all good bat habitats. If you know where bats forage on the school grounds this could be added to your school habitat map for the Green Schools Biodiversity Flag. Discussing and designing plans for creating bat-friendly habitat can also be included in the work plan for the Biodiversity Green Flag. Tree lines, shrubs, native planting and water features can all boost insect availability and increase the chances of the school being used by foraging bats. You can also seek a Heritage in Schools expert to arrange a visit from a bat expert.